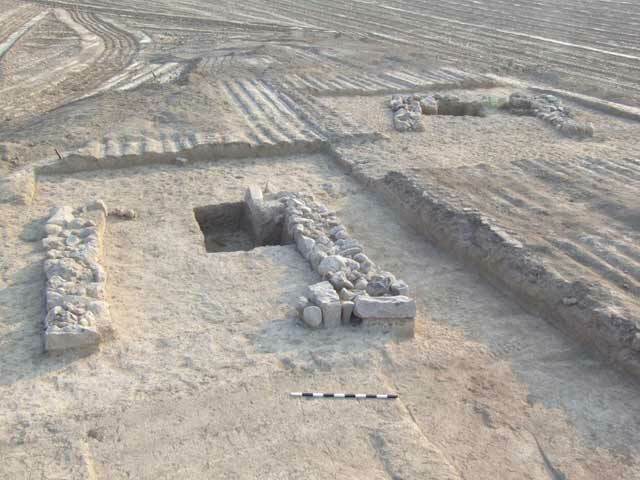 During August 2007, a trial excavation was conducted northeast of Tel Eshtori (Permit No. A-5218; map ref. NIG 2498/7119; OIG 1998/2119), after ancient remains were exposed in the course of digging two evaporation pools (1, 2). The excavation, undertaken on behalf of the Israel Antiquities Authority and underwritten by the ‘Of Tov’ plant, was directed by W. Atrash, with the assistance of Y. Ya‘aqobi and Y. Lavan (administration), V. Essman (surveying and drafting), H. Smithline (photography), A. Shapiro (GPS) and D.T. Ariel (numismatics). 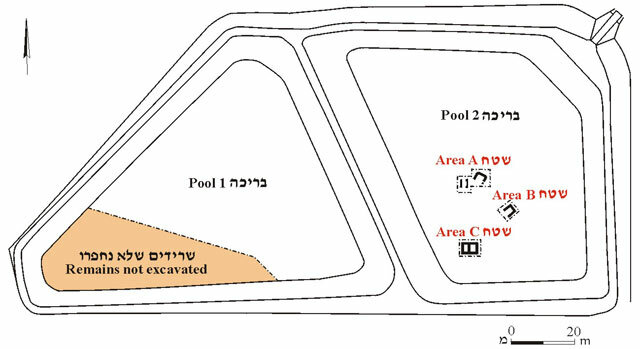 Three excavation areas (A, B, C; Fig. 1) were opened in Pool 2, c. 500 m northeast of Tel Eshtori. 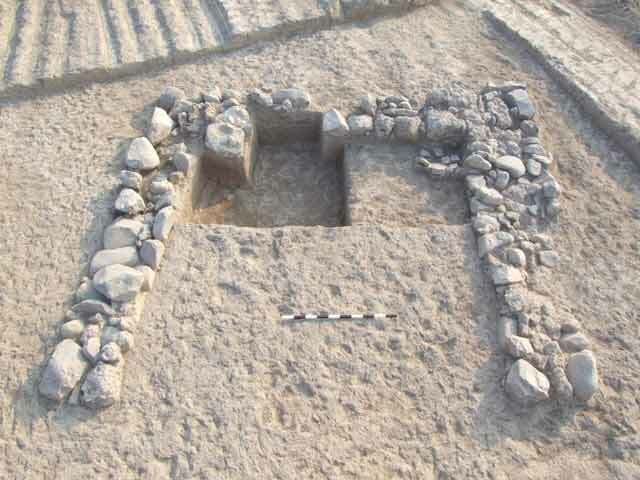 Eight squares were excavated and remains of three settlement strata (I, II, III) were discovered. 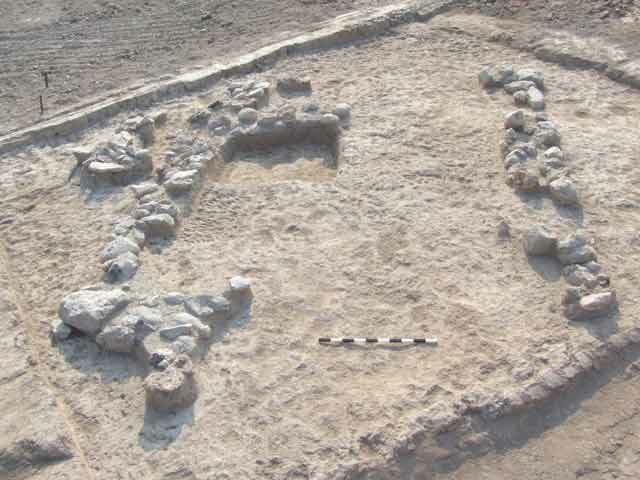 Remains of a building that dated from the Iron Age until the end of the Hellenistic period were exposed in Stratum III (Area B; 8 × 8 m). Remains of a fort that was built in the Late Roman period were exposed in Stratum II (Area C; 8 × 10 m). The remains of two adjacent buildings from the Byzantine period were exposed in Stratum I (Area A; two squares, each 8 × 8 m). 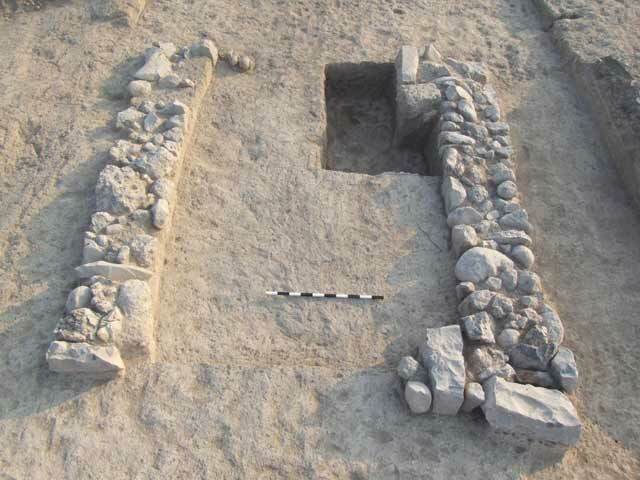 The remains discovered in Pool 1 were covered over and the area of the pool was reduced in size so no excavation was conducted there. Stratum III (Area B). Remains of a building (5.1 × 5.5 m; Fig. 2) were discovered. These included three walls (width 0.7 m), arranged in a U-shape, which were built of travertine fieldstones and preserved a single course high. The entire length of the southwestern side of the building was open. The walls were founded on a floor of tamped earth, in which a few potsherds from the Iron Age and Hellenistic period were mixed. The floor was founded on sterile agricultural soil. A layer of soil that contained a few potsherds from the Iron Age and the Persian and Hellenistic periods was discovered on the floor. Stratum II (Area C). Remains of a rectangular fort (6.7 × 8.9 m; Fig. 3), which was divided in the center by a partition wall into two similar units, were discovered. The outer walls (width 0.9 m) were built of basalt fieldstones set on sterile soil and preserved two courses high. The partition wall, built in a similar manner, was preserved three courses high. The walls of the fort were preserved to a uniform level below that of the floor. The upper part of the walls was probably built of mud bricks that did not survive. The remains of the fort were covered with soil that contained a few potsherds and two coins that dated to the Late Roman period. Stratum I (Area A). Remains of two adjacent buildings (A, B; Fig. 4) were discovered. The northern building (A; 4.0 × 7.3 m; Fig. 5) included three walls (width 0.65–0.90 m) arranged in U-shape that were built of basalt and travertine fieldstones and preserved a single high. The whole length of the building’s southern side was open. The floor consisted of tamped earth and was founded on sterile soil. A soft limestone that had a shallow round depression in its center was exposed above the northwestern corner of the floor. A round installation that was built of small fieldstones and probably served to stand a ceramic jar was discerned in the northeastern corner of the floor. A layer of soil that superposed the floor contained potsherds from the Byzantine period. The southern building (B; 3.8 × 4.5 m; Fig. 6) comprised two parallel walls (each 0 .7 m wide), preserved a single course high, which were built of basalt and travertine fieldstones. Two engaged pillars were incorporated in the eastern wall of the building. The tamped-earth floor was overlaid with a layer of soil that contained a few potsherds from the Byzantine period. It seems that the exposed building remains were part of farming settlements, scattered across an extensive area. 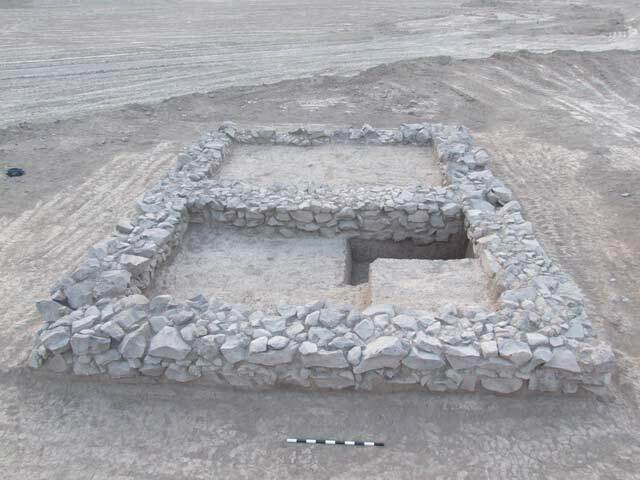 Building stones were not visible in the vicinity of the site and it was probably necessary to bring stones from nearby to construct the buildings. It appears that only the buildings’ foundations consisted of stones, whereas the upper structure of the walls was built of mud bricks that did not survive. Based on the ceramic artifacts, the site was apparently first inhabited during the Iron Age and continued to be occupied until the end of the Hellenistic period. Following a hiatus, the settlement was renewed in the Late Roman period and continued to exist until the end of the Byzantine period; it was most likely abandoned due to the Moslem conquest. 3. Stratum II, fort remains, looking east. 4. Stratum I, remains of two buildings, looking north. 5. Stratum I, Building A remains, looking northeast. 6. Stratum I, Building B remains, looking north.